"I was sitting by my computer and the balcony door was open. My dog, Tigull, came whimpering to me and wouldn't stop until I followed him onto the balcony. "Tígull was trying to point out to his owner that a small bird was lying unconcious on the balcony. Owner Gunnar Kr. Sigurjónsson says that he spotted a small redpoll lying motionless on the balcony floor. He picked up a straw paper basket and placed it over the bird who didn't move. "I thought it was dead but then it started fluttering about and sat down. I took it inside and gave it a bit of water and some seeds. After a while he began tweeting so I realised him." 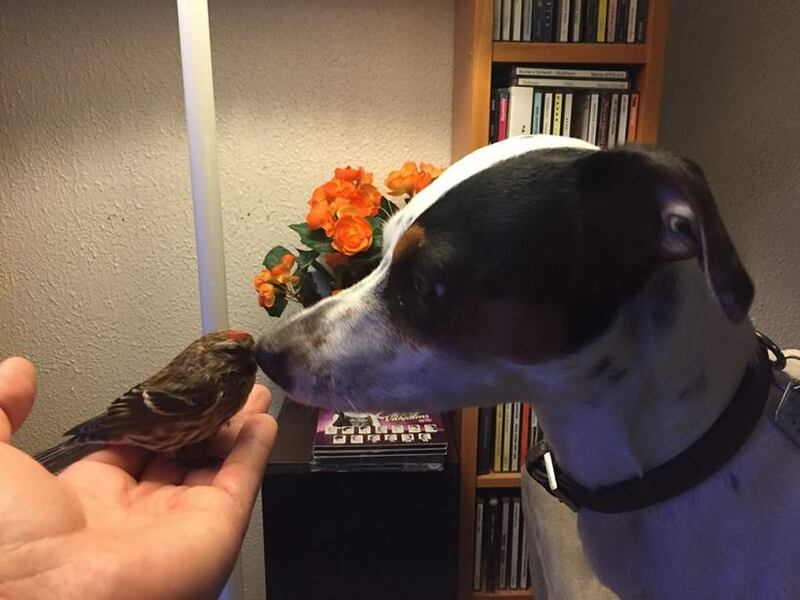 Sigurjónsson then placed the bird in his palm and took a few photographs of Tígull the dog sniffing the bird. 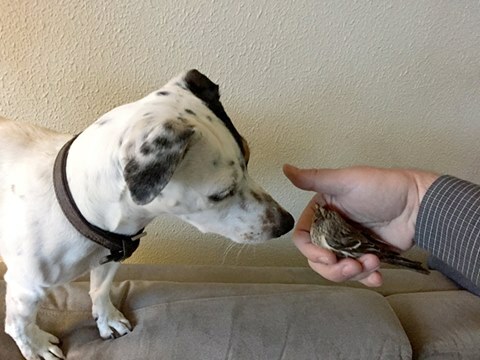 "The bird then proceeded to fly in a large circle around the living room, and then sat down on the dog's head! Then Tígull licked the bird and we took it to the balcony." He placed the bird on the railing and went back inside. An hour later he saw the bird sitting in the same spot. "It was pretty cold outside so I decided to bring it back inside for the night. He spent the night in the basket and the next morning he was really lively. I think he knocked himself out on the window so he was probably feeling a bit groggy before. I released him back outside at noon and he was fine. I was happy that I had kept him inside for the night to recover."